A former executive at Zynga — the company responsible for FarmVille — says he’s now fixed his “disruptive” gaze on the outdated pizza-business model. The future of pie delivery, argues Valley insider Alex Garden, is being pioneered by robots at his Zume Pizza, and Bloomberg got a look inside the new company. The process seems to involve a team of enormous and very expensive-looking robots preparing pies that then get baked by a giant bank of ovens en route to customers. 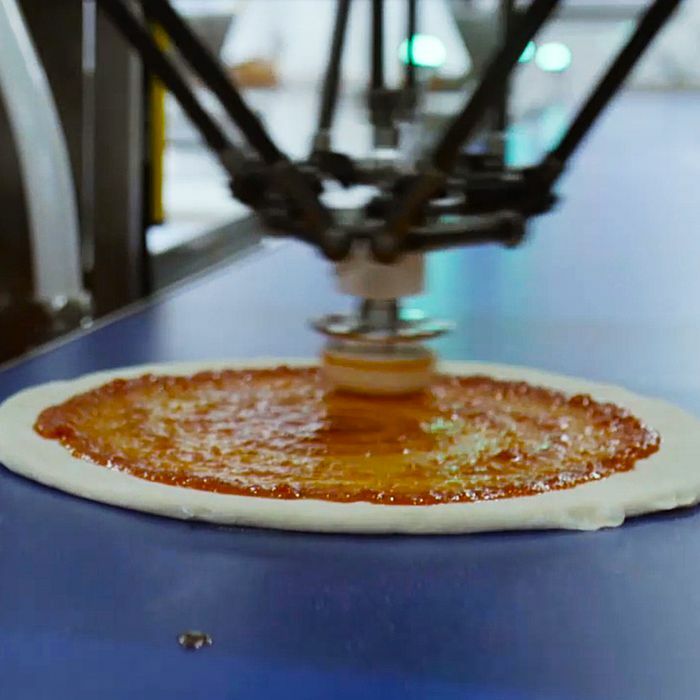 One of the robots (her name is Marta) expertly spreads sauce “perfectly but not too perfectly, so it looks just like an artisan product.” Another, named Bruno, then “gently, without disturbing it,” moves the pizza into an 850-degree oven to prebake. Traditional humans are still required for tasks like sprinkling cheese, driving the delivery truck, and walking sealed boxes to customers’ doors, but these seem like minor obstacles, really. After all, even Domino’s has robots that warm pies on the road, and military-grade robots that vigilantly hunt down customers using GPS. Pizza seems the ripest for full automation within fast food, so it’s safe to assume the whole industry is steadily moving toward the all-robot business model.